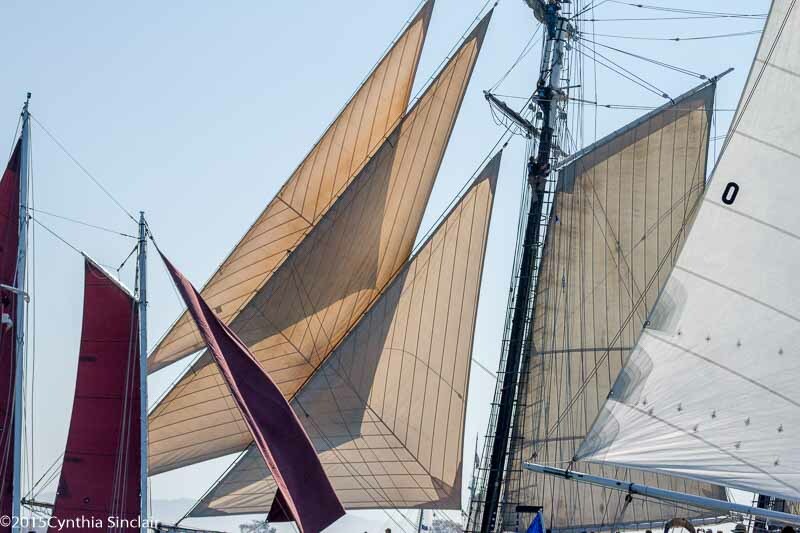 The Silver Gate Yacht Club in San Diego hosted the 27th Schooner Cup Regatta on March 28. A gathering of 14 schooners from the west coast competed in three classes to benefit the Navy-Marine Corps Relief Society. Winds started out 12-15, went up to the low 20’s, eased to 12 but picked up again as the boats reached to the finish line. California’s official tall ship at 142’ overall, the Californian raced the first time carrying passengers giving them an experience of how it would be sailing an 1850’s era Coast Guard Revenue Cutter. The lovely Atkins schooner Maid of Kent was the smallest schooner at 36’ LOA. Two one hundred year old plus Crowninshield schooners, Fame (1910) restored in 2010 by Dennis Conner and Martha (1907) lovingly rebuilt by Robert d’Arcy of the Martha Foundation in Port Townsend, Washington. This is the first time they sailed against each other and despite their large difference in length, Fameat 29’ LWL and Martha with 50’ LWL, finished less than 5 minutes apart elapsed time. Robert d’Arcy wrote, “Martha, with a bone in her teeth, was working right up to within feet of Curlew’s quarter wave, the two girls in lock step as if we were attached by a powerful bungee cord. As we approached the # 4 buoy the tactical talk turned to how to get by Curlew, who was every bit as fast as Martha and well sailed. “Our moment came as Curlew over stood buoy #3. As we came up into the wind to tack we could see Curlew doing the same to cover us, but it was a few boat lengths too late. Martha now commanded a three boat length advantage as the two thoroughbreds raced back into the bay past Point Loma. It was Dirigo II, a 65’ LOD Alden design built in 1939 but interestingly enough with a gaff rig, also from the Puget Sound area, that surprised everyone. They sailed into San Diego two days before the race with the skipper and two young crew, picked up some local sailors, sailed a perfect race and took first in Class B as well as the coveted Schooner Cup Trophy.